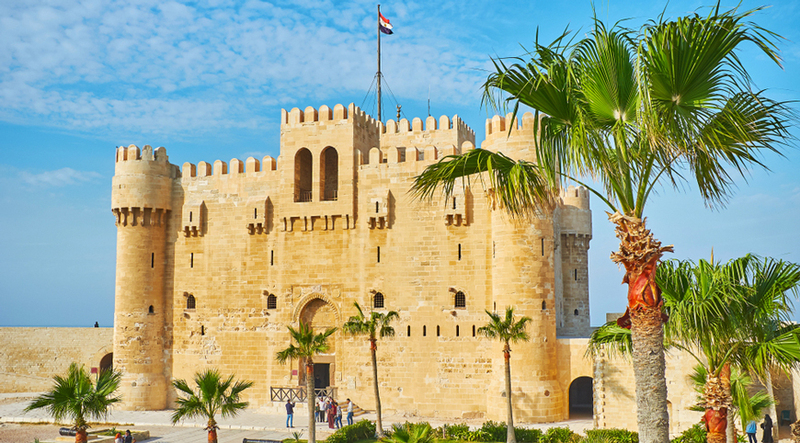 Qaitbay citadel is a magical defensive fortress was built in the 15th century and it is located on the coast of the Mediterranean Sea in Alexandria, on the eastern side of the northern tip of Pharos Island at the mouth of the Eastern Harbour. It was built by Sultan Al-Ashraf Sayf al-Din Qa’it Bay in 1477 A.D. He established the citadel to defend the city of Alexandria from the advances of the Ottoman Empire but his efforts went in vain, as they put control over Egypt in 1512 A.D. The current form of the fortress is not the original one as it was damaged during the British Bombardment over Alexandria in 1882 and it was rebuilt at the beginning of the 20th century. Qa’it Bay actually chose the location of the citadel that was the site of the legendary Pharos Lighthouse, which was damaged in the 14th century by earthquakes. King Farouk wanted to turn the citadel into a palace in 1904 but the Egyptian Navy turned it into a Maritime Museum. The citadel houses a small naval museum. Qaitbay Citadel has an interesting history that links it to the unique Lighthouse of Alexandria. So let’s take some time to speak about this mesmerizing lighthouse. The Lighthouse was considered to be one of the Seven Wonders of the World and it kept having its function until the Arab Conquest in addition to other natural disasters, which changed the shape of the lighthouse. An earthquake occurred in the 11th century and its octagonal part was damaged. They built a mosque on the top of the lighthouse but another earthquake happened that destroyed the whole building. The Circassian Mameluke Sultan Al-Ashraf Qaitbay was one of the most prominent mameluk sultans ruling for about 29 years. He decided to build the citadel to defend the place against the Turks, who were threatening Egypt at that time. He built his great fortress and placed a mosque inside and the citadel continued to function during the Mameluke and the Ottoman periods but it was kept out of the spotlight in 1882 after the British Bombardment of Alexandria city. The establishment of the fortress started in the month of Rabi Alawal, 882. Sultan Qaitbay visited the site of the ancient lighthouse with some Mamluke princes and decided to build the great Citadel of Alexandria, that you can visit during your trips in Egypt. The construction was finished in the month of Shaban 884. The Sultan provided the fort with some soldiers and weapons. He also dedicated many waqfs and he used them to finance the construction works and the salaries of the soldiers. Rulers who came after Qaitbay maintained the citadel very well. There was a prison inside the citadel that was constructed for the princes and the state-men whom Qaitbay wanted to keep away. When Qaitbay felt a threat from the Ottoman Empire, he ordered all his soldiers to prepare themselves, prevented weapon to be taken out of the city and he even stated the death penalty for those who steal anything from the castle. The Ottoman Turks conquered Egypt and they decided to take care of the citadel so that it becomes their shelter. The castle started to lose its importance with the decline of the Ottoman military and eventually it fell into the hands of the French troops in 1798 A.D, mainly because of the citadel garrison weakness. In 1805, when Mohamed Ali Pasha became the ruler of Egypt, he renewed the citadel and repaired its outer ramparts. His reign was like another golden era for the citadel. Orabi Revolt happened in 1882, and a large part of Alexandria city was damaged by the British bombardment, especially the site of the citadel. The facades in the north and the west were totally destroyed and the citadel was neglected until 1904 when the Ministry of Defense restored the Upper floors. King Farouk wanted to turn the citadel into a palace in 1904 but the Egyptian Navy turned it into a Maritime Museum. Qaitbay citadel was designed in the square shape with many chambers, towers, and walls. The Inner walls of the citadel, which were constructed with solid rocks, contain the barrack of the soldiers and the weapons’ storage rooms. The Outer walls contain four defensive walls to protect the citadel. The main tower of the citadel consists of three floors. The first floor contains the mosque of the citadel with four small iwans, and a terrific Mehrab. In the second floor, there are many passageways, large halls, and many chambers, which had many purposes. Today the Citadel of Qaitbay is considered to be one of the most important touristic attraction in Alexandria, which is visited by millions of tourists yearly because of its magical construction and great history. So you can explore our Egypt tour packages and choose your dream vacation.